The big question is: What did he know and when did he know it? We may never get a straight answer from Te'o. Nor from his family, who have thrown hissy-fits anytime the media doesn't work as Manti's PR agency. But what about those who spent the most time with Te'o over the last few years. According to reports, Teo's teammates had suspicions about Lennay Kekau going back to the beginning of this season. Sports reporter Jackie Pepper spoke to a member of the Notre Dame football team who declined to be named. That player said Te'o's story didn't add up, but they never confronted him about it. The Notre Dame football player, who asked for anonymity, told Pepper On Sports, "No we all knew he had only seen her once. But when the media was saying how he went through both deaths we knew," said the source, referring to the back-to-back deaths of Te'o's grandmother and girlfriend Lennay Kekua, who allegedly died of Leukemia. In response to my follow-up question asking if the source thought that Te'o kept the story going because of the media attention, the player replied, "Yeah. Right after the Michigan [State] game. He should have never brought her in the media. His grandma passing was enough." Notre Dame's victory over Michigan State and subsequent media explosion appears to have been the turning point for the source and many of his teammates. The source said while the players discussed their suspicions amongst themselves, they never confronted Te'o. "We would never bring it up. But we would look at him when he would get all emotional during media about his girl," the player said. When asked if he thought Te'o was a good actor, the player replied, "Very good." 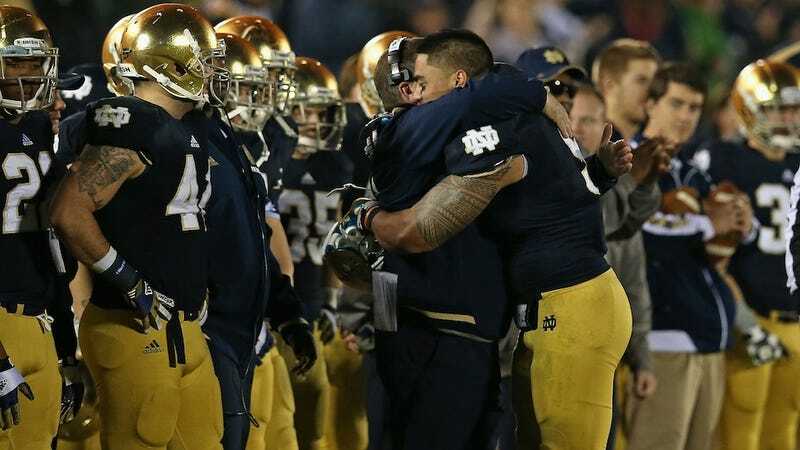 The debate among teammates wasn't whether or not Manti actually knew this girl - it was clear that they had been in contact; no, players just didn't think that it was fair to call Lennay Kekua Manti's girlfriend, period (it is well-known on campus that he has had relations with other girls during his time at Notre Dame). They recognized what was going on for what it was - a terrible publicity stunt used to fuel Manti Te'o's Heisman campaign. In fact, many of the players privately commented that they didn't want the students to wear leis in support of Manti and wouldn't participate themselves - they cited that the team never responded so publicly to tragic events for other players. But there was also the feeling that Manti didn't deserve to benefit from publicity from the death of somebody he barely knew. Last night, AD Jack Swarbrick hitched his and the university's wagon to Te'o's flawed version of events. The crux was that Te'o only learned he had been hoaxed on Dec. 6, and the university didn't find out until Dec. 26. But if Te'o's teammates knew something was up going back to September, and he continued to repeat the lie to reporters throughout the season, then something doesn't add up with his story. And remember, it's Notre Dame's official story now, too.